Everton's Gylfi Sigurdsson has ousted Raheem Sterling atop the Power Rankings chart. The Toffees talisman secured a 2-1 win at Leicester with a goal-of-the-season contender - his fourth league goal in as many games. Arsenal made it nine consecutive wins in all competitions after a 5-1 goal rout at Fulham, with Alexandre Lacazette (No 2) and strike partner Pierre-Emerick Aubameyang (No 6) both scoring twice. 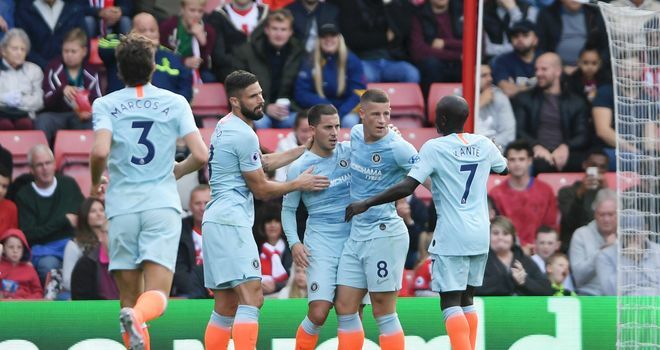 Chelsea's Eden Hazard (No 3) scored his seventh league goal this term and assisted Alvaro Morata during a 3-0 win at Southampton to extend his lead atop the accumulative season chart. Wolves right-back Matt Doherty (No 4) scored the match-winner in a 1-0 win at Crystal Palace - with team-mates Rui Patricio (No 5) and Jonny (No 9) also retaining top-10 standings. Liverpool held Manchester City to a goalless draw at Anfield, with Sterling (No 7) being substituted mid-way through the second half, while City stopper Ederson (No 8) made two saves to keep his fourth successive league clean sheet. Why not add Gylfi Sigurdsson to your team? Unai Emery admits Arsenal’s 3-2 home defeat to Crystal Palace was a very frustrating result but says finishing in the top four is still in their hands. The Sky Sports pundits were universal in their praise of Man City midfielder Phil Foden, whose winner against Spurs sent the champions top of the table.